We are in love with Sara’s latest Signature Collection- Black & Gold! Check out this lovely card from Linda Fitzsimmons and have a go at making your own! Cut a piece of Sheena card 5×5” square. Colour half with the Gold Sparkle pen, and the rest with the black sparkle pen. Take a wide paintbrush, dampen with water and blend in the centre. Dry thoroughly. Place the foil transfer into the centre so that it covers both colours. Burnish (or run through the Gemini using thin metal die sandwich) place gold foil on the black area, and black onto the gold. Burnish again to transfer the foil.Add corners to the project and repeat as above using the opposite colour foil. 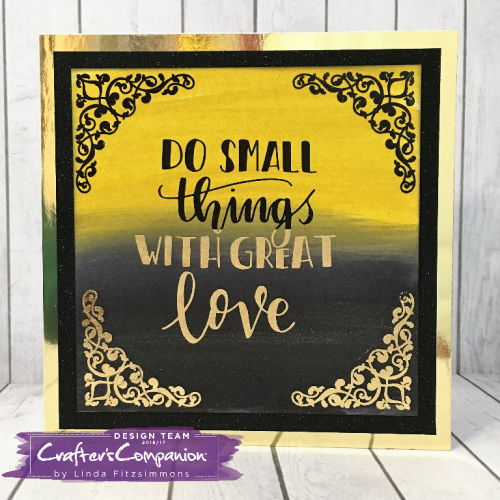 Add corners to the project and repeat as above using the opposite colour foil. Ink the edges with Black soot and add to a matt of Black glitter card 5 ½” square and Gold mirri card 6” square. Add to a 6” card base.